Alabama - That loss in Oxford sure feels like a long, long time ago. Mississippi State - You can't make up a whole game of crappy play in one quarter against a team like Alabama. Ole Miss - Nothing new to see here. 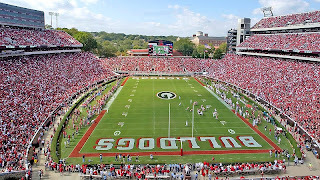 Georgia - How in the world did the Dawgs lose to Florida and South Carolina? Auburn - Karma can't score enough points for you when you spend more time looking at the rear end of Georgia's running backs. Missouri - I'll give Missouri credit, they keep winning games they should win, which is something Georgia can't say. LSU - Arkansas grass isn't tasty. Tennessee - Tennessee is patient zero in the SEC East's crazy season. Arkansas - Arkansas finally got due enough. South Carolina - I don't know what is more satisfying: Florida losing or smug Spurrier being smug over beating a bad Florida team. Florida - Fired Agent Muschamp is my least favorite Agent Muschamp. Kentucky - Mike Stoops' team cost him a lot of money with this losing streak. Vandy - I'm not real sure Vandy is playing football anymore. Now it gets hard. I'm willing to admit even the Georgia-Auburn thing is hard. The distinction I made is all the teams fifth and up are capable of beating the other five if both teams play their best games. The next group consists of teams that could beat those five if the top five if they played their best game and those in the top five were named Georgia. And the game were played in Columbia or Jacksonville. The last group consists of teams Georgia has lost to. Then there is Kentucky and Vandy.